A focus group screener is a brief survey that specifies characteristics of the people you want to interview and study. You use a screener to recruit and select respondents for focus groups or depth interviews. The moderator writes the screener, and sends it to the recruiter. The recruiter asks prospective respondents the questions in the screener. Then the recruiter selects respondents who meet specifications for the focus group or depth interview. Those candidates who don’t meet specifications are rejected. Screeners include questions about demographics and product experience. Here are typical screener criteria for consumers, businesses, and experts. Screener criteria define demographic and category parameters for consumers and businesses. You want to interview the right people because they give useful information and knowledge. Customers have direct experience with your product. They speak about their attitudes and behaviors about your product or service. Category users buy and use your competitors’ products, not yours. You want to know why. Prospects are ready to try the product category. What will it take to get them to buy and use your product? Experts spend much time focused on a topic or industry. Talk to them. They give expert opinions, judgments, and advice. They are trade magazine editors, authors, journalists, consultants, industry analysts, financial analysts, trade association executives, professors, professionals, and industry executives. Channel personnel are people who work among distributors, dealers, or retailers. They sell the products in the category or service them. People you want to talk to are typically owners, executives, managers, salespeople, account managers, and service technicians. You want to know what products channel personnel recommend to end users and why. Management includes internal executives, managers, and people from relevant departments. Five to ten depth interviews with internal management are worthwhile and often revealing. Aim to benchmark management’s knowledge and views about a topic. Compare management’s internal thinking to external thinking. Look for ways to supplement their information and knowledge. Fill the gap in knowledge. You don’t want people without product category experience. At best, they supply vague opinions, which may be irrelevant. But there is an exception. Prospects who don’t have category experience but are ready to try the category are worth interviewing. Professional respondents are people who attend focus groups or take interviews to make money. Cash incentives and prizes are the attraction; it is a part-time job for them. Unfortunately, professional respondents are widespread in consumer research. Professional respondents are a waste of time and money. They provide useless babble and bias the sample. Screen them out, if you can, using your focus group screener. Recruiters should be able to spot professional respondents. Recruiters keep databases about respondents and these recruiters should be able to check the number of times respondents have previously joined in interviews, using their database. Competent recruiters check proof of respondent identification, usually a driver license. Work with professional recruiters to weed out professional respondents. Tell your recruiter that professional respondents are unacceptable. Warn your recruiter, if he or she tries to pass on professional respondents. Use your focus group screener to select the right respondents. The wrong respondents are a waste of time and money and are misleading. 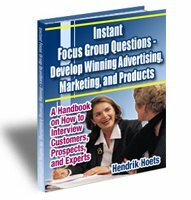 Get hundreds of focus group questions, tips, and techniques now.